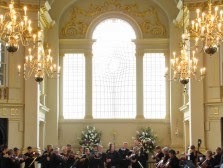 Having recorded a disc of Howard Blake's more recent music (see my review) in 2013, Sir Neville Marriner and the Academy of St Martin in the Fields gave a concert of Howard Blake's music at the church of St Martin in the Fields on Tuesday 25 November 2014. The orchestra's principal flautist, Michael Cox, was the soloist in Blake's Flute Concerto op.493a, and the orchestra's principal clarinettist, James Burke, was the soloist in Blake's Clarinet Concerto op.329a, the wind players from the orchestra played Blake's Serenade for Wind Octet op.419 and the concert opened with Blake's new arrangement of his most popular piece - The Snowman. Here the Snowman Fantasia op.532 was played by the strings of the orchestra, conducted by Sir Neville Marriner with Blake himself narrating. The Snowman is one of those pieces that we think we all remember, but how much do we really? The music is inextricably linked to the song, Walking in the Air which was sung by Aled Jones, except of course that in the original film it was sung by Peter Auty (now a distinguished operatic tenor) and when Blake originally sketched out the score there was no song, just a melody. In fact Blake wrote the music first, based on an initial animators' idea and Raymond Briggs book. The animation was done to Blake's piano score and it was this version to which he returned for the new string arrangement. Originally intended to stand alone, without either images or narration, Blake had been persuaded by Sir Neville Marriner to include the spoken story and the result created rather a striking melodrama. Blake's wit and sense of enjoyment of the story came over strongly, not just in his narrative but in the music itself now shorn of visual images. The rich detailing of the string writing played dividends, especially in the strong yet disciplined performance it received from the strings of the Academy of St Martin in the Fields. I was particularly struck by how the big tune, in its various appearances sung by the strings, was given in a poised and evocative manner without any attempt to milk it. Blake's writing for strings often echoed that of his predecessors and I caught rather nice hints at such pieces as Trevor Duncan's Little Suite. Howard Blake's Flute Concerto dates from 1996 and is written for flute and strings. It starts with the flute, which has a solo over tremolando strings. This lovely melody is the basis for variations which the flute works over the strings. Cox not only brought a nice fluency to the decoration but played with a lovely warm tone, complemented by the strings' flexible yet firm sense of line. The second movement, marked Scherzo con spirito was rather perky with a characterful interplay between flute and strings. the Andante expressive was slow and elegant, with some fabulous passagework from Cox in the variations and a rather touching cadenza. The final Marcia Grazioso was perky again, with a lovely element of humour. There was a something of neo-baroque feel to the concerto, in the way that Blake wrote for his soloist and strings, but the sound world is very much 20th century. The soloist, Michael Cox, not only showed that he had the technique to play all of Blake's notes, but brought a thoughtful warmth and real emotional depth to the piece. It was a performance which really made me view the work in a different light, particularly the way Cox played the lovely opening theme when it returns at the end of the concerto. Blake's Serenade for Wind Octet was written in 1990, it was played by the wind players from the orchestra without a conductor. The work is very much modern harmoniemusik with Blake revelling in the sound that two oboes, two clarinets, two horns and two bassoons can make when playing together. That said, the textures were very much led by the principal oboe, played by Christopher Cowie, and principal clarinet, played by James Burke. The opening Grazioso con moto was full of infectious rhythm and layers of melodic detail. The players gave the unashamedly romantic music a lovely warm sound. The Serioso come una marcia lente started with a lovely melancholy melody on the oboe, with a rocking accompaniment, and these two elements were developed throughout the movement with the melody passed between oboe and clarinet, creating some intensely passionate melodic moments. The finale, Molto vivace capriccioso had a slightly jazzy edge to the rhythms and was an infectious delight, with a lovely interplay between the instruments. The players gave the piece a lovely romantic warmth and depth of sound, and the work seemed to develop a greater emotional richness than on the recording. The concert concluded with Blake's Clarinet Concerto. Written originally for Thea King, the work has a slightly complex history (see my review of the CD for more details), but in James Burke's performance came over as highly passionate, melancholy piece. It opens with a short rhapsodic moment for solo clarinet which leads into the opening movement, Moderato molto deciso. Though the clarinet plays a lyrical melody over a syncopated rhythmic accompaniement in the strings, the sense of melancholy English rhapsody is never far away in the work. Quite impressively Burke never allowed the number of notes in the solo part to overwhelm him, and they were all subsumed into a lovely sense of lyrical rhapsody. Another lyrical recitative links into the Lento serioso again a solo line beautifully sung yet suffused with a very particular sort of English melancholy. The finale, Round Dance: Vivace quite simply combines lots of notes with some infectiously jazzy rhythms. The number of notes seemed to bother Burke not a whit, and his passagework was both spectacular and expressive, finishing with an incredible bravura finish. Blake's writing for clarinet in the work has always struck me as evoking Gerald Finzi's clarinet concerto, and this reveals layers of historical background and influence. The first soloist in the concerto, Thea King, was married to Frederick Thurston who premiered Finzi's concerto. And Blake's teacher at the Royal Academy was Howard Ferguson, who had been taught by RO Morris and RVW and who was a great friend of Gerald Finzi. Cox brought out these influences, but made the work his own and gave it a real emotional kick. Throughout he was well supported by Marriner and the orchestra. It was lovely to hear a whole concert of Howard Blake's music and gratifying to see such a good audience for the Academy of St. Martin in the Fields brave enterprise. In addition to the Academy's support for Blake's music, perhaps what was most impressive was the way that two orchestral principals took the solo roles in a pair of virtuoso conccertos. I do hope that we get to hear more of Howard Blake's music in concert, there is plenty worth hearinIng and he has reached opus number 666!